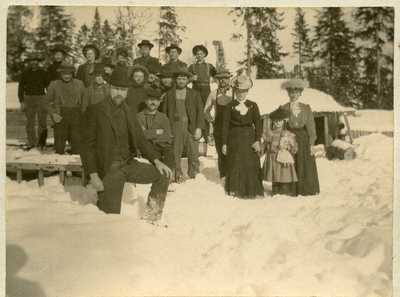 "Amos A. Graffte Lumbering Crew at Holeb, Maine "
A black and white photograph from the Amos and Octavia Graffte papers of a logging crew, Holeb, Maine, circa 1904. Text written on the back of the photograph notes that Amos is kneeling in the foreground. Mrs. Graffte with dark dress and white at neck is holding the hand of her daughter Marjorie. The other woman worked for Mrs. Graffte who cooked for the crew of men in the winter. The handwriting also notes that some of the men were probably Canadian Frenchmen who came over to work for the winter.